This book draws on the work of thinkers and doers throughout the world who have grappled with the challenge of planning complex institutions, especially health systems and development projects. Their problem: Conventional planning methods often do not work. The solution: Involve all the key stakeholders in making the plan. The challenge: Devise a planning system that the principals and stakeholders can trust, and that is inclusive, balanced, and dynamic. Facilitated participatory planning (or FPP) is a new way of planning for a world that is complex, competitive, and fast-changing; a world where managers, staff and other stakeholders must have their say and own the ideas for any plan to work. This book charts the evolution of FPP from pioneer concepts of awareness, empowerment, learning-by-doing, visualization, creative group processes, and incremental questions into a complete and up-to-date system of principles and techniques. It carries case studies that show how FPP has been used successfully where other planning methods have failed. 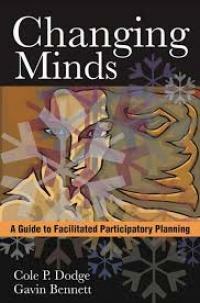 Changing Minds is authored by former Regional Director of UNICEF and FPP pioneer Cole P. Dodge, and award-winning Strategic Communication Specialist Gavin Bennett, with inputs from many other experts in health, planning, and communication from all corners of the world.